That current engaging-to-really–aggravating clique of American media darlings has good reason to visit the National Archives: that’s right foodies, now there’s an exhibit for you. Slide past the coiled snake of a line paying respects to the Constitution, and you’ll find the What’s Cooking,Uncle Sam? gallery, chockablock full of rhetorical goodies. 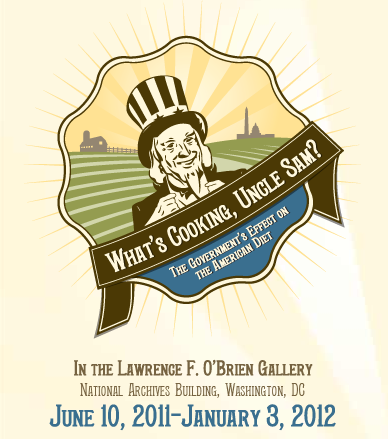 Exhibit Cover Image for NARA's What's Cooking, Uncle Sam? Your correspondent particularly savored the Vitamin Donut lobbying letter, but it’s the contemporary framing that stuck with her. From the exhibit title forward, the star of USA food policy is not the Federal government, not Congress, not any Administration; it’s Uncle Sam. He’s regulating labels, promising troops their rations and lauding victory gardens. Is it metonymy, euphemism, playful register shift, character-creation for the grand narrative? School’s out today, so discuss amongst yourselves.